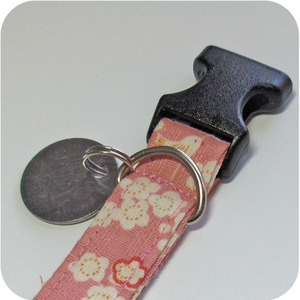 It's easy to make a new dog collar from your old one! Whenever Lila needs a new collar I just make her a new one reusing the hardware from her old one. Once you've done it a time or two it only takes about 15 minutes to make a new one. 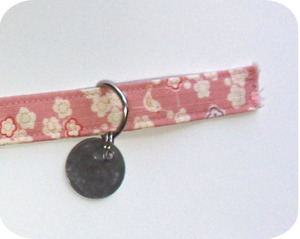 A fabric collar is much more fun and probably more comfortable for your dog than those thick nylon ones. However, I would NOT recommend using this collar as a leash attachment unless your dog is fairly well behaved on the leash. 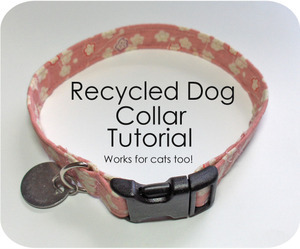 This collar is more for style (and the fun of recyling) and a harness would be more secure in case of any sudden squirrel lunging or cat chasing attempts. These instructions are for a custom fit--i.e. the collar will no longer be adjustable. Since Lila's neck size never changes I stopped making it adjustable. 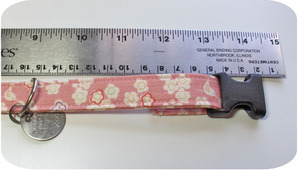 If you want to make your collar adjustable take a good photo of your dog's current collar before you cut off the hardware so you'll have a reference for how it fits together. 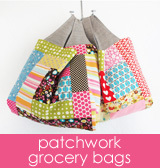 You'll also need to measure how long you'll need to make the fabric piece to have room to adjust it. 1. 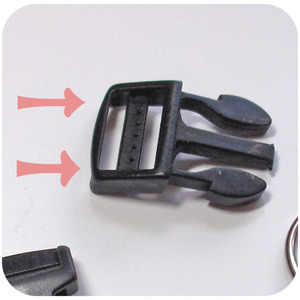 Unclip collar from dog and take a good look at how it is put together. You'll see it's a fairly simple construction. Do not make any adjustments to the size once it comes off your dog. 3. Lay the collar out flat and measure from one end of the buckle to the other (see arrows in photo below). 4. Take your measurement and add 4". This is the length your fabric piece will need to be. Jot the number down somewhere. 5. Cut hardware pieces from old collar. If you have a nylon collar some of the bigger ones can be difficult to cut through. Go slow, be careful and don't use your favorite pair of scissors. Below are the pieces you'll need to reuse for the new collar. The adjustable buckle can be used for some other fun project--make yourself an apron with an adjustable neck or something. 6. On either buckle piece measure the space between the arrows as shown in the photo below. 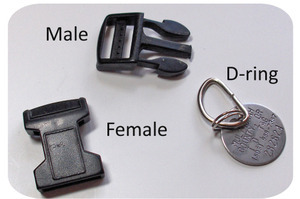 Most buckles are 0.50" (S), 0.75" (M), 1.00" (L). Multiply this number by 4 and write the number down with your length measurement. This is how wide your fabric piece will need to be. 6. Cut one fabric piece the length and width you determined above. 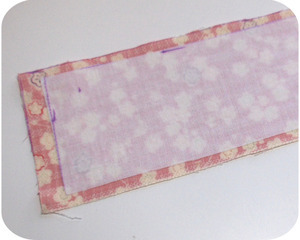 Cut one piece of iron-on interfacing just slightly smaller than your fabric piece. 7. 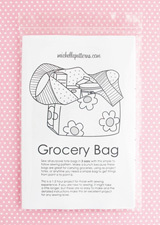 Apply iron-on interfacing to the wrong side of the fabric following the interfacing manufacturer's instructions. 8. 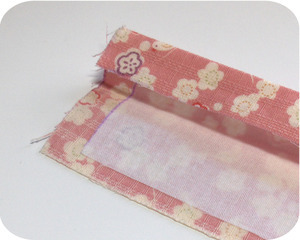 Fold your fabric piece in half lengthwise and press to make a crease down the center. 9. Open up fabric and press one side in toward the center crease. Repeat on other side. 10. 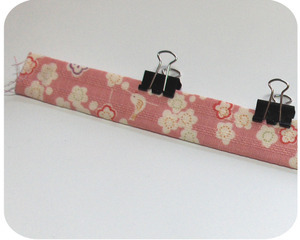 Fold fabric piece in half again and pin or clip in place. 11. 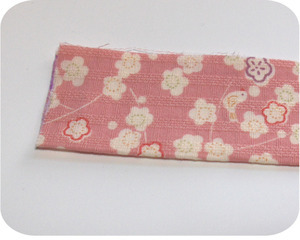 Topstitch around edges of fabric piece. Zigzag across ends if you like. 12. Attach male end of buckle. 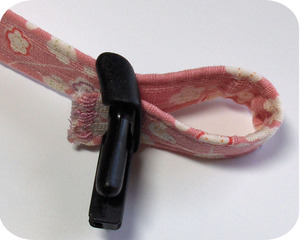 Hold buckle so it's face up and insert fabric piece through slot furthest from the prong side. The fabric will come from underneath the buckle and go over the plastic bar and back down out the backside through the slot closest to the prong end. Pull about 1.5" of fabric out the back. 13. 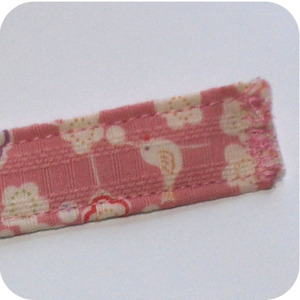 Sew across fabric piece as close to end as you can and then again as close to the buckle as you can. 14. Slip D-ring onto fabric piece via the unfinished end. Slide it down the the end with the male buckle to keep it out of the way for the moment. 15. 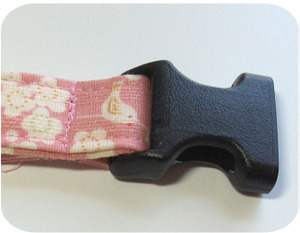 Insert unfinished end into female buckle part. 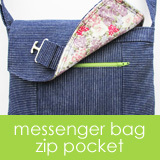 Hold buckle so it is face up and insert fabric through the top of the slot and out the back side. 16. Now it's time to adjust the length you need to fit your dog's neck. Just fiddle with the fabric piece until you have the length between the buckles the same measurement you made in step 3 above and some fabric left over on the back side to attach your d-ring. 17. 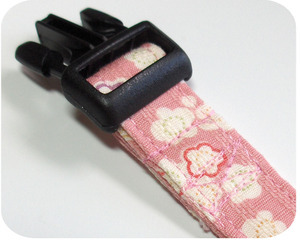 Sew female buckle in place by stitching as close to the buckle as your machine will allow. You may want to put the collar on your dog now to make sure your collar fits and make any necessary adjustments by removing the stitching and resewing. 18. Slide d-ring back to the female end and up to where you stitched. 19. Sew across fabric encasing the d-ring on the side that is not sewn (see dotted lines in photo below). 20. 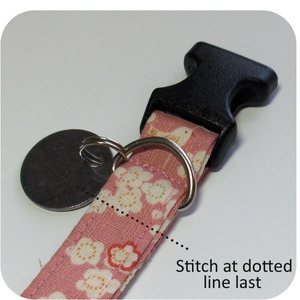 Trim any stray threads and put the collar back on your dog!